Valentine’s Day … the day of Love, and the language of love is - food! At Comida, we speak the language with the best, delicious French and Italian inspired dishes. Share the occasion – share the time. Make your Valentine’s Day Reservation at Comida and enjoy the language of Love. Valentine's Day Set Menu $120 for two. For Valentine's Day the Chefs have created a special sharing menu consisting of a shared entree, two glasses of Prosecco, two mains, and two desserts. Earlybird Special: Book prior to Monday the 11th and enjoy a special early-bird price of $110 for two. Caprese Skewers for two: mozzarella balls with fresh, local tomatoes, Basil and balsamic pearls. Seafood Paella: a classic Spanish-style dish made with saffron, rice, squid, prawns and mussels. with a Ratatouille and Rocket Cream Sauce. Authentic traditional-style tiramisu (recipe from Mauro’s mother). A special Valentine's Day Eton Mess - a traditional English dessert consisting of a mixture of strawberries, broken meringue, and whipped double cream. 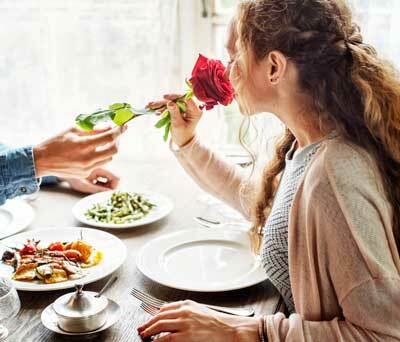 ​Valentine's Day Set Menu $120 for two. Book prior to Monday the 11th and enjoy a special early-bird price of $110 for two.